A mysterious guy gripping a Halloween mask and raving about how someone is going to kill everyone is admitted into a hospital. Shortly after that, some other guy comes in and pull his skull apart with his bare hands. From there he does the only thing one can do after doing something like that- he soaks himself in gasoline in his car and blows himself up. The attending physician, Dr. Challis, decides to figure out what is going on, possibly because of natural curiosity (unlikely), possibly because the dead man's beautiful daughter is around (likely). They eventually track the single lead down and hilariously this leads them immediately and directly straight to the heart of an evil conspiracy involving magic Halloween masks. This is the third of fourth time that I've watched this movie and my opinion keeps changing. I remember being disappointed the first time around because Michael Myers is not in the movie. Then after watching all the awful Halloween sequels that did have Michael in them, I thought Halloween III was a pretty decent change of pace. 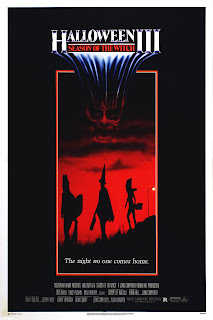 I liked it even more this time around; Halloween III is a pretty awesome 80s horror flick. The absolute best thing about his movie is the character of Dr. Challis. This guy is totally sleazy, flirting with any woman who he comes into contact with. And he is a hilariously incompetent and uncaring father, blowing his visitation period with his kids to go investigate this spooky mystery like some kind of sleazy divorced version of the Scooby gang, except just one guy and no dog. It's got a great synthesizer soundtrack by John Carpenter and it looks fantastoc, with plenty of wonderful shots (including the scene the totally awesome poster art was taken from). And the out-of-nowhere gore effects don't feel nearly as out of place as they did in Halloween II. 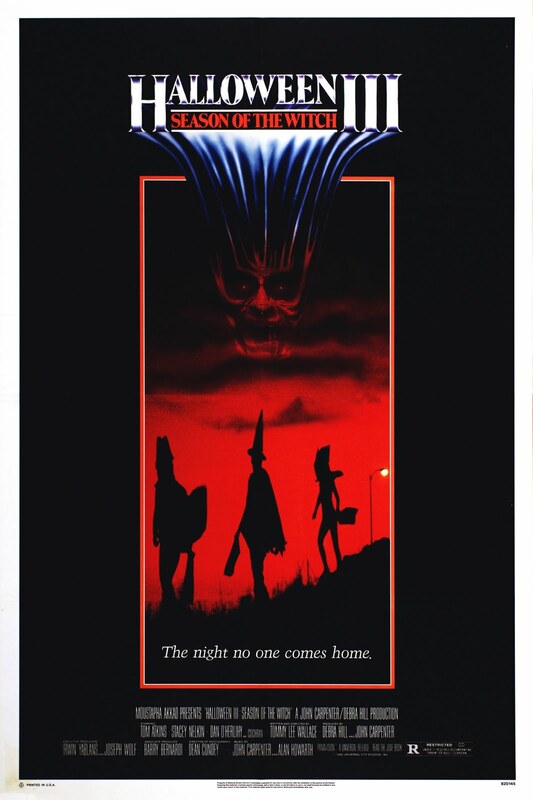 One of the best Halloween movies, if not second best. That is a really wicked poster. It is indeed a great poster. That is definitely one of the best shots in this movie. Soy de Mexico y esta parte de HALLOWEEN 3 Y la primara parte son las unicas 2 cintas de la serie que me gustan y me dejaron marcado de por vida...las restantes 2,4 y 5 no le doy hasta la fecha la mejor importancia...sabra leer español....? Sorry I don't speak Spanish. :( I used google translate though and understand what you wrote. I agree. 1 and 3 are the only great Halloween movies. 2 is especially bad!